For 4X4 Aplications,Has a Stock 4X4 output shaft, different Transfer Case Kits Available. Our Level Two Transmissions parts have proven very reliable up to torque levels around 400-450 ft/lbs and our return rate demonstrates this. We experience less than 1% failure on our Level Two units. In applications with greater torque output than this, the input shaft/drum and sun shell assembly strength must be addressed, which is what we do with our Level Three Transmissions. Anyone who has built serious Th-700R4 Transmissions has, at some time experienced failure of one or more of these components. Behind engines above 450 hp and 450 ft/lbs. of torque output, the input shaft to drum connection point becomes prone to fracture and the spline sun gear section will start ripping off the sun shell. Our level Three Transmissions have the following parts added for increased strength and reliability above 450 hp and 450 ft/lbs of torque. 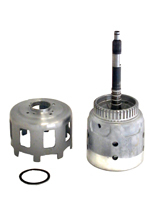 Reinforced input drum & sun shell for optimum strength with 30% larger fourth gear servo piston. These components are specifically engineered to help prevent breakage in applications with exceptionally stout motors. Experience has proven this engineering to be correct! The shift quality, timing and feel of these Level Three Transmissions are the same as our Level Two units. This can be described as aggressive high performance at Wide Open Throttle (W.O.T.) but, very street able when driving at light to medium throttle settings. Great for all around high performance street use! These parts will live at horsepower and torque levels over 60% greater than the stock components are able to tolerate! Our level Three units have everything included in Level One and Level Two plus the Extreme-Duty package!